Well writing these goals out really helped! I did EVERYTHING on my October List!! I read more than 2 books (Hallelujah!) We carved pumpkins. And by "we" I mean Ryan and I!! I BOUGHT the light for the dining room! We figured out Halloween Costumes, we finished Scandal season 3 and we even baked something. How about that for efficiency!! So what is up for November? - Yep, taking it up a notch and feeling confident about it. Holla. 2. Get the new light in the dining room installed. It should arrive any day and I don't want it sitting in the box until Winter Break. That could happen my friends. 3. Have someone/ a family over for dinner. I hosted Halloween and I forgot how much I love to have people over! 4. Catch myself up with Scandal. 5. Finish my Christmas shopping. Yep, you heard me. I want to BE DONE by November 30th. We shall see. 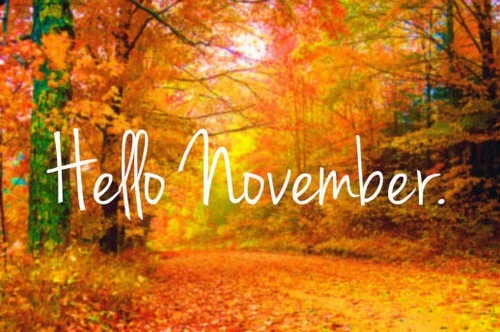 Any goals for yourself in the month of November? I love your goal and list writing (and accomplishments!) I can't wait to see the new dining room light.